The newly appointed Ambassador of the Republic of Maldives, His Excellency Omar Abdul Razzak has presented his Letter of Credence to the President of the Democratic Socialist Republic of Sri Lanka, His Excellency Maithripala Sirisena at a ceremony held this afternoon at the President’s House. During the brief meeting after the presentation of Credentials, President Maithripala Sirisena welcomed Ambassador Razzak to Sri Lanka and expressed his sincere hope to strengthen the bilateral cooperation between the two countries. 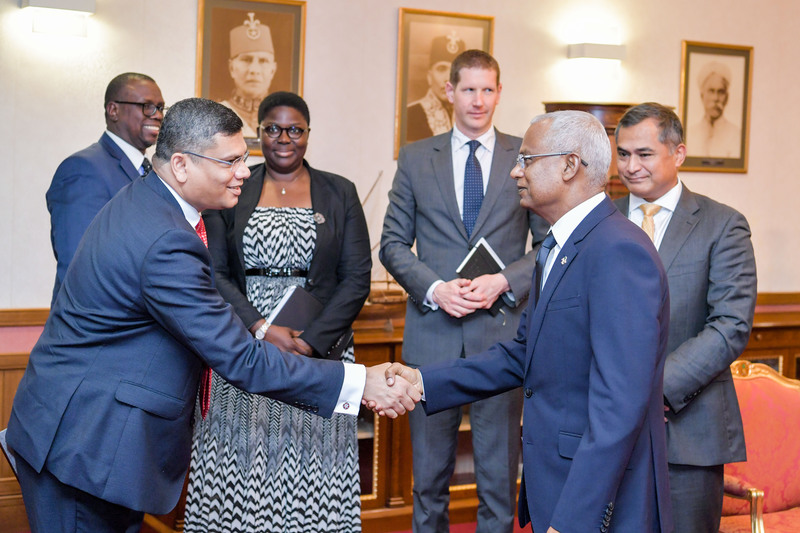 A delegation of Commonwealth Secretariat staff on an assessment mission to the Maldives paid a courtesy call on His Excellency President Ibrahim Mohamed Solih this morning at the President’s Office. During the meeting, President Solih welcomed the delegation to the Maldives and extended deep appreciation for the support provided to the Maldives over the years. Speaking during the meeting, the President noted that re-joining the Commonwealth is one of the key pledges of the government. He also noted that the Maldives stands ready to abide by the charter of the Commonwealth. He relayed that the country is looking forward to re-joining the Commonwealth. The Commonwealth Secretariat Staff Team on an assessment mission to the Maldives paid a courtesy call on His Excellency Mr. Abdulla Shahid, Minister of Foreign Affairs today. At the meeting which was held in the Ministry of Foreign Affairs, Minister Shahid expressed the political will of the Government of Maldives in becoming a Member State of the Commonwealth at the earliest possible opportunity, and committed the Maldives in pursuing the accession process in full cooperation with the Commonwealth Secretariat. He mentioned that the Maldives had a lot to gain from the Commonwealth and its Member States, in the country’s journey to further strengthen and bolster the country’s institutional capacity especially in the judicial sector. He also mentioned that the Maldives had a lot to contribute as well, through its experience in democratic consolidation, and its leadership in the areas of climate change and human rights. Ambassador-designate of Maldives to Germany, His Excellency, Mr. Ahmed Latheef paid a courtesy visit to His Excellency, Vice President Faisal Naseem, this morning at the President’s Office. The Vice President congratulated the Ambassador-designate on his posting and expressed his eagerness to work closely with the Ambassador to further solidify the friendly ties between Maldives and Germany. The Vice President emphasized Education and Health as two priorities areas, for which we should request expertise from Germany. He further stated the importance of promoting Tourism through positive advertising and maintaining good trade relations with Germany. Moreover, the Vice President requested the Ambassador to facilitate efficient consular services to Maldivians living in Germany, with special regard for Maldivian students. The Ambassador-designate reciprocated the Vice President’s sentiments regarding strengthening of bilateral ties, and gave assurance that during his ambassadorial tenure he will strive to fulfill the policies of President Solih’s Administration. Concluding the call, Ambassador-designate and the Vice President discussed training opportunities for youths. The Minister of Foreign Affairs of the Republic of Maldives, His Excellency Abdulla Shahid concludes his official visit to London from 26 to 29 January 2019. During the visit, Minster Shahid held fruitful discussions with officials of the Government of United Kingdom. Today, Minister Shahid met with Minister of State for Commonwealth and UN at the Foreign and Commonwealth Office, Lord Ahmed of Wimbledon and Minister of State for Foreign and Commonwealth Office, Rt Hon Mark Field. The Ministers discussed ways of further strengthening bilateral ties between the two countries. Minister Shahid conveyed the government’s decision to upgrade the Maldives mission in London by deputing a resident Ambassador and expressed sincere appreciation of the Government of Maldives for the UK Government’s decision in opening a British Embassy in the Maldives. Minister Shahid also addressed the 29th Governing Council Meeting of Community of Democracies. In his statement Minister mentioned the struggle of Maldives in attaining democracy. He also highlighted on the wish of Maldivian people to rejoin the Commonwealth.